Anthonius (Anton) Voordouw, son of stableboy Lambertus Voordouw and Maagje Ruijtenbeek, was born 17 February 1906 in Utrecht, the Netherlands. At the age of 19 Anton finished his study to become pharmaceutical assistant. Four years later, in 1926, he left for the Dutch East Indies, accompanied by his newly wed older brother Theodorus, technical employee at Rijkswaterstaat, and his wife Helena van Es. In the Dutch East Indies Voordouw got a job as pharmaceutical assistant, first at Rathkamp & Co in Soerabaja (Java), later on in Makassar (Celebes). In 1931 he married Helena Maria Joolen by proxy, since Helena still lived in Utrecht, the Netherlands. But Helena soon joined her husband and in 1936 their daughter was born. 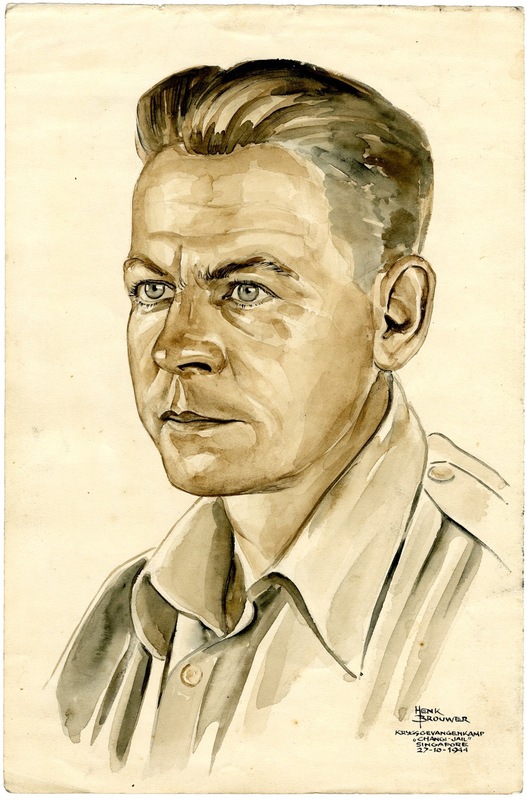 During the mobilisation in December 1941, Anton Voordouw was appointed infantry soldier in the Landstorm. Soon after the capitulation Voordouw was taken prisoner of war and sent to Glodok and Tjimahi (the ‘Bold Head Camp) to end up in Changi, Singapore. Due to his education he worked as auxiliary nurse in these Japanese camps. After the war Voordouw returned to Java, where he worked as pharmaceutical assistant in Batavia for a while. In December 1946 he was finally repariated and shipped to Holland. What was left of Voordouws belongings after his death in 1989 is kept in two Dutch archives. Museum Bronbeek keeps some of his personal belongings, such as his food kettle with inscription, postcards he sent to his wife, his cabin trunk, some camp coins and a selfmade chess game. Museon Museum in The Hague keeps some of his drawings. His most important belonging, the portrait Henk Brouwer made of him, was donated to Bronbeek Museum by Voordouw’s daughter in December 2018.